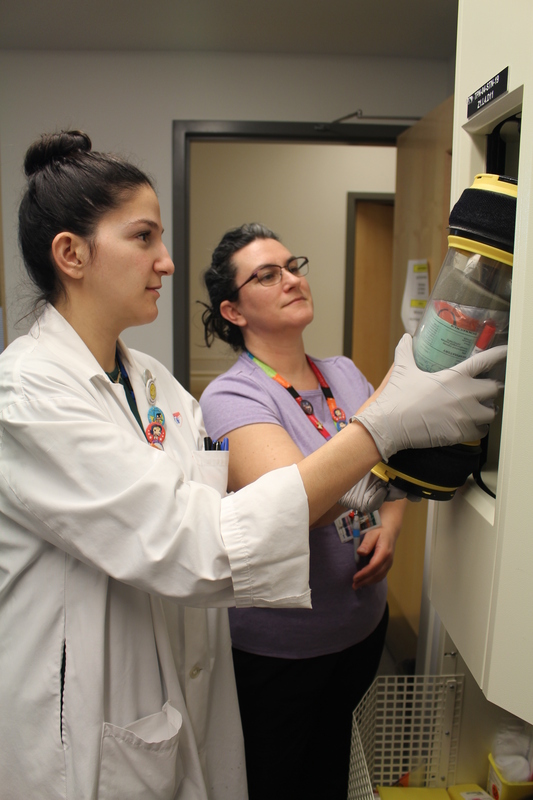 A day in the life of … two medical technologists! 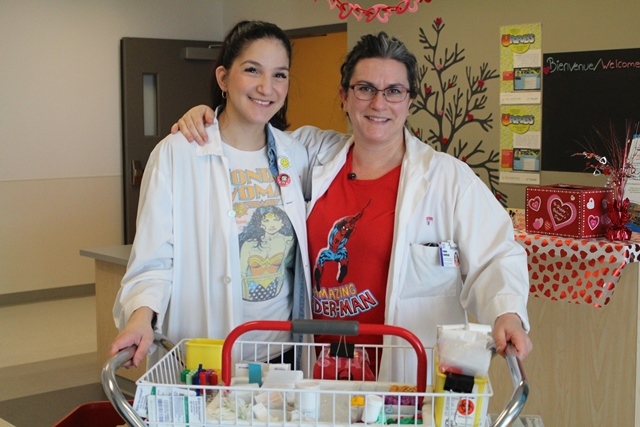 Nadine and Dimitra are medical technologists, but hospital staff often refer to them as blood technicians. They spend their mornings drawing blood on the wards, and finish their days in the Test Centre on B2. There are six medical technologists who rotate on the inpatient units and four who are stationed in the Test Centre. On the wards, they are solely responsible for drawing blood, also known as procurement. 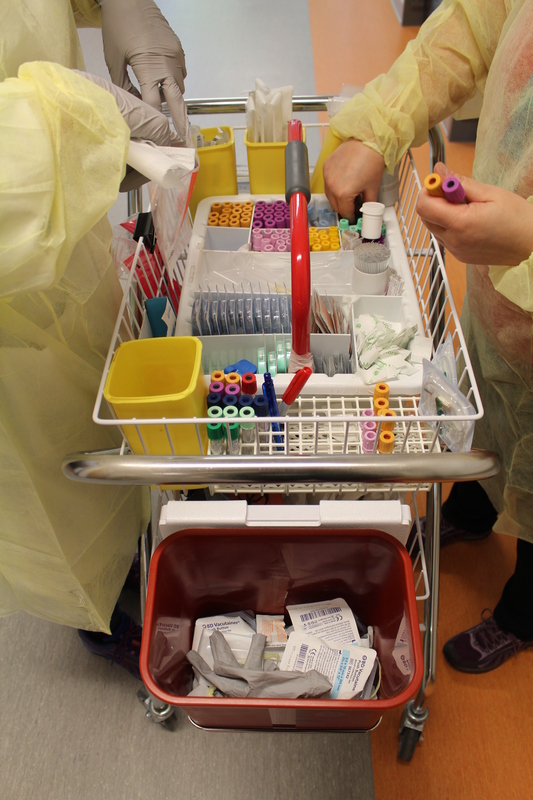 In the Test Centre, while they do continue to draw blood for outpatients, they also collect urine or stool specimens, perform throat and nasal swabs, and carry out sweat tests. Depending on the test, they will be asked to draw a specific amount of blood. “It’s amazing how much information can be gathered from a tiny test tube of blood,” she says. Most of the tests being conducted are either routine, or prescribed in order to rule out certain diseases, genetic conditions, or for research purposes. Besides procurement, medical technologists also perform sweat tests on Thursdays to rule out cystic fibrosis. 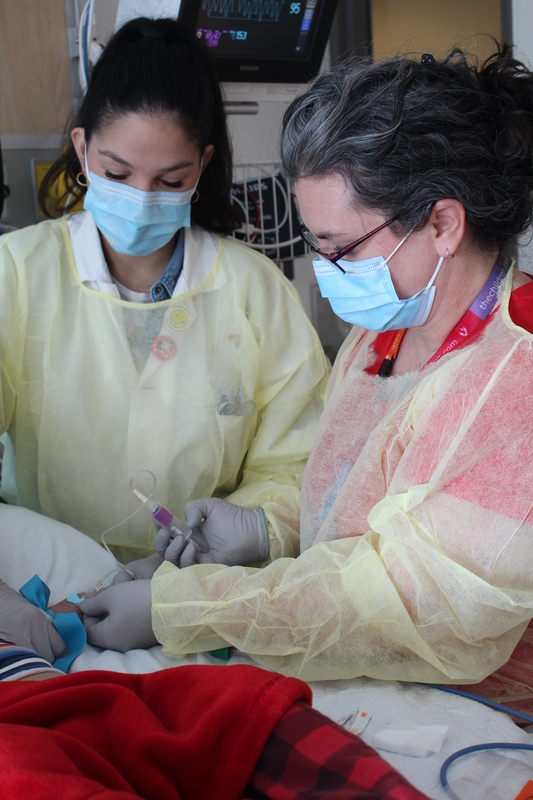 A small amount of gel made up of an odorless chemical, called pilocarpine, is applied to the child’s arm. Once the gel is applied, two electrodes are strapped to the arm and held down for five to seven minutes. “Pilocarpine in conjunction with the electrical stimulation helps the sweat glands to produce sweat,” explains Nadine. A plastic coil, or as Dimitra likes to call it, “a superhero watch” is then strapped to the arm and wrapped in plastic wrap and warm clothing. “We then tell the patient to go out and be active for 30 minutes. The goal is to collect as much sweat as possible,” says Nadine. The sweat is then tested by the medical technologists in the Test Centre. They measure the amount of chloride in the sweat by placing the collected sweat in a Chloridometer. Normally, sweat contains very little of this substance, but a child with cystic fibrosis will have two to five times the normal amount of chloride in their sweat.